I know I’ve shared several Fall and Thanksgiving posts this year, but this one is different. This is about our recent trip to the mountains. This is where I would have Thanksgiving if I could, and maybe next year we will. This is about relaxing and taking time off to be with your friends and family. I’m hoping you don’t feel pressured and stressed to have a Pinterest-worthy event this year. 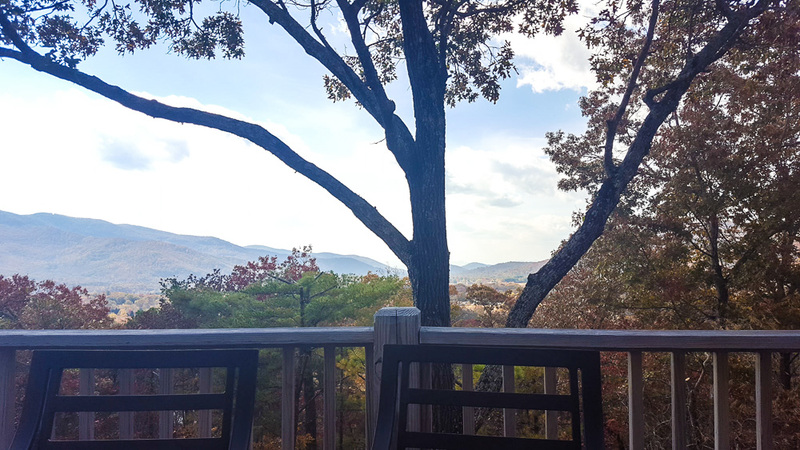 Today, I am sharing a special trip to our house at the top of the mountain in Black Mountain, NC, that’s all about relaxing and enjoying Fall. Since we rent out our house, we have a management company that handles all those details. The cool thing is that when we arrive, they treat us like they treat our guests. 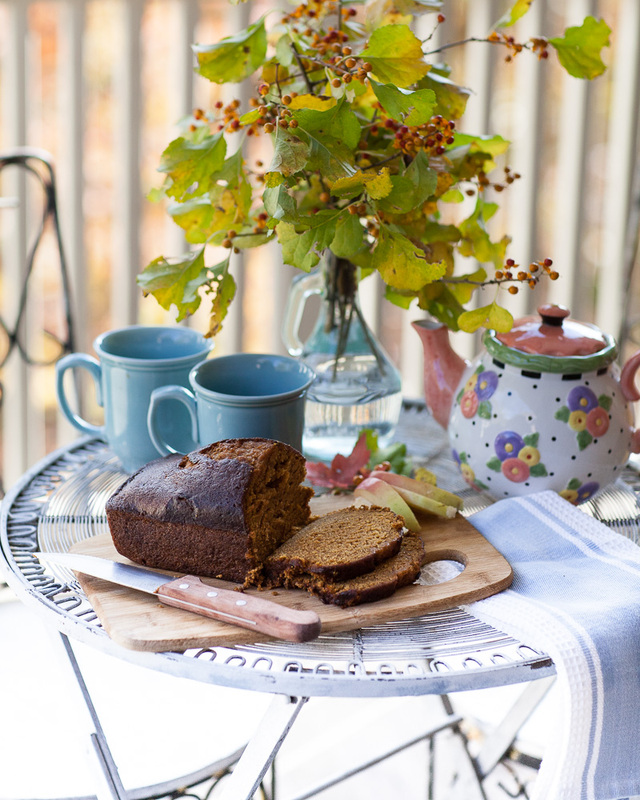 Fresh pumpkin bread is there when we arrive along with a hand-written welcome note. A little local honey makes it even more special. We spent our days outside enjoying the amazing Fall color. I had fun picking up the pretty leaves around our house. The nights were cool, and we slept with the windows open. 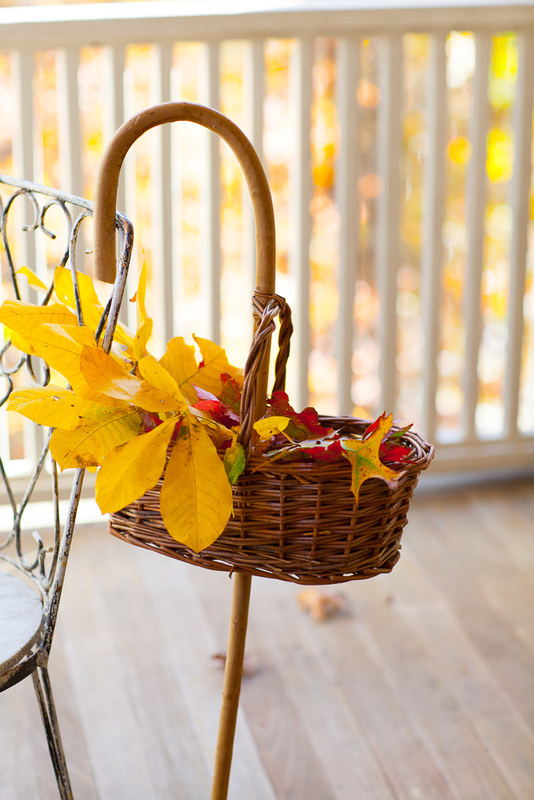 My gathering basket came in handy as I collected leaves and berries. I cut some branches and set them in my dough bowl. 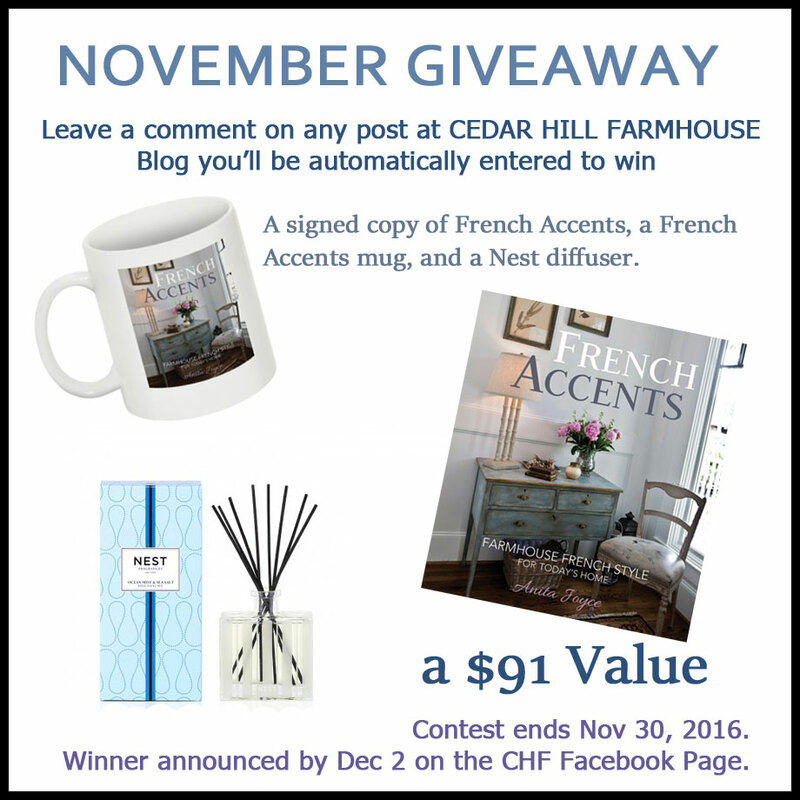 Remember that EVERY TIME you comment during November on any post at Cedar Hill Farmhouse blog, automatically enters you to win my prize. Details here. This is the view from our front porch. The stresses of city life just melt away here. There was a ladybug convention in town apparently. They were everywhere. 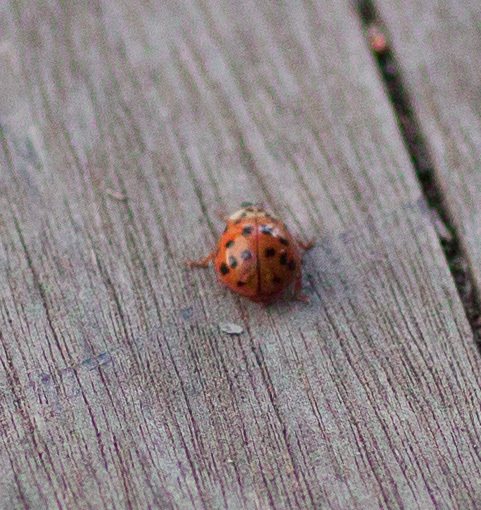 We left the doors open most of the day, and then I saw our house was full of ladybugs. I hope they made it back out; I’m partial to the little creatures. Every day on the deck we feel so blessed to see this view. The view has opened up since we did some tree trimming. 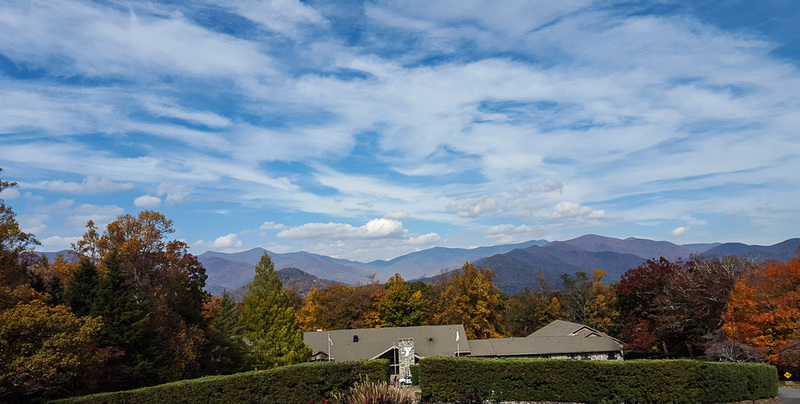 There are so many church retreat centers in Black Mountain, including Montreat (Presbyterian) Ridgecrest (Baptist) Chrismount (Christian Church) and so many more. One that we can see from our deck is the Blue Ridge Assembly, founded 1912. If you look, you can make it out in the distance. (I used a telephoto lens so you could see it better.) It’s the long building with the columns. It’s on a mountain on the other side of town. One day we decided to take a drive over there. As we got to the Blue Ridge Assembly, we took a photo looking back at our house. I can’t see it from the photo, but I think it is behind the evergreen tree on the left. I can see why they selected this spot, what a view!!! It’s so pretty! The photo below was taken on the grounds as well. I think some of the best color we saw was in Black Mountain. Seriously! This was our view as we took a walk down the road from our house. I hope the people that live here, understand how very blessed they are! Since people ask, yes you can stay here! To get more information about availability, etc. CLICK HERE. One day we drove on the Blue Ridge Parkway. I wish I could have taken you with me. Break-taking is the best way I can describe the views. As the sunlight is fading, the best part of the day is yet to come. Sunsets are always best enjoyed from the deck. Nature puts on a glorious show of beautiful color across the sky. And then the most amazing thing happens. The lights of the town start to twinkle in the valley below. I love seeing the town after dark. I imagine all the townspeople snug in their homes with their family around them enjoying a home-cooked meal. I hope you enjoyed this little virtual retreat. May you have a wonderful Thanksgiving. I hope you take time to sit back and enjoy the season and time with family and friends. Be sure to check out the other blogs on this Thanksgiving tour. We live in the foothills of the Blue Ridge Mts. And it is just beautiful. I would never live anywhere else. I would certainly have had a hard time leaving Black Mountain! Thank you for reminding this West Texan what fall looks like. It has been a long time since I have been home (Ohio) in the fall! Next year, I may need to go! 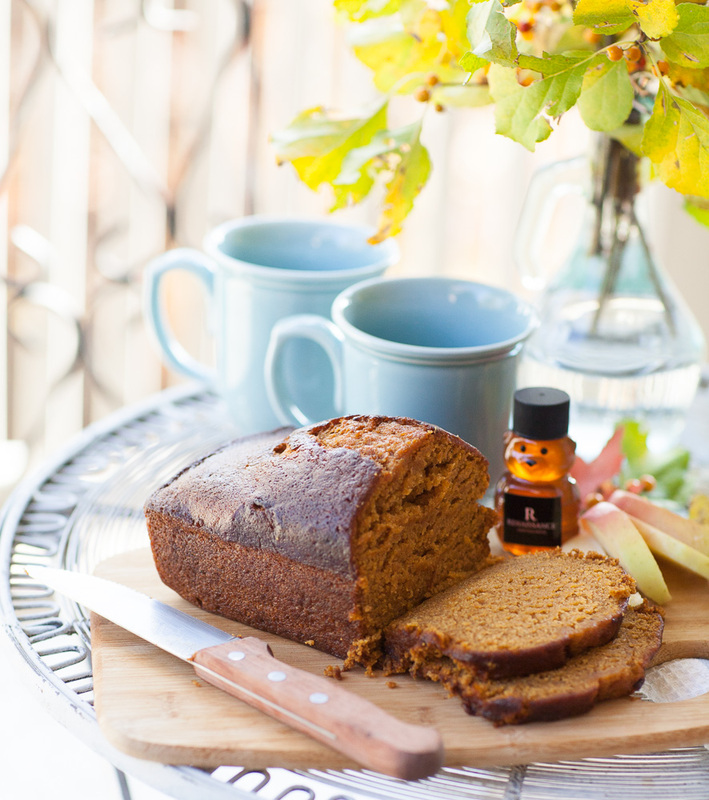 A mountain house retreat sounds amazing and nothing beats local honey. We found a source where we’ll be moving in the future and it’s simple the best. I read where a tablespoon a day keeps you healthier. It must be working because I feel amazing. 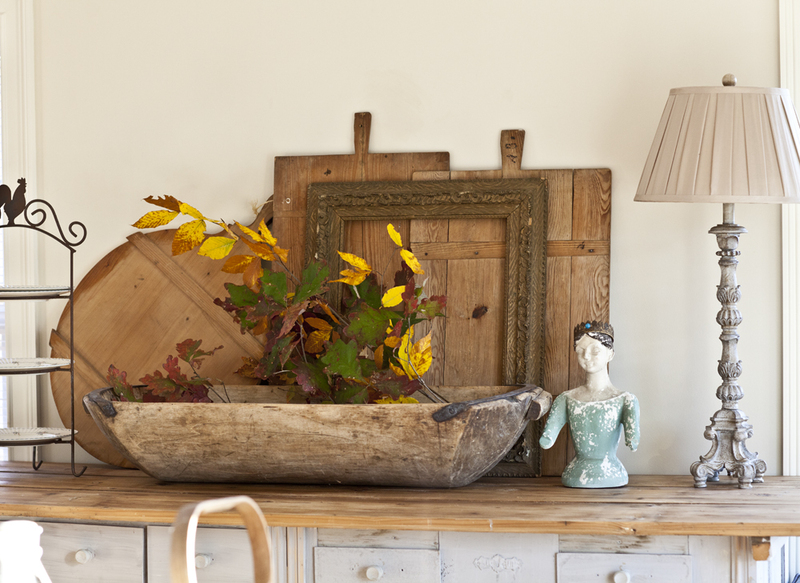 Love these images it’s the great escape for fall. Beautiful!! What wonders Mother Nature presents us! 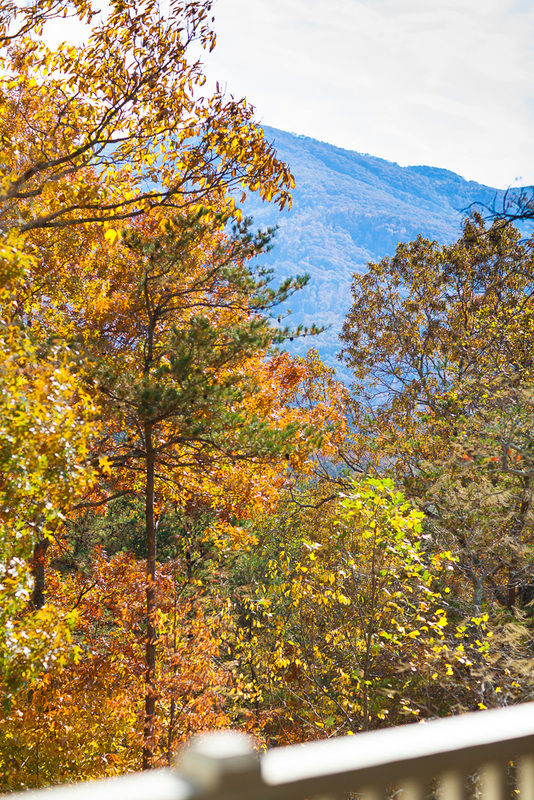 Love the mountain vistas…the leaves, berries, pinecones…such gifts. Just back from Vermont and I wished I could stay forever…I am certain Black Mountain makes you feel this way, too! So lovely. Reminds me of our years in Charleston WV. We didn’t have a view like this but the area was mountainous also and Fall was spectacular. I totally agree with you, I would never leave there either. Such a great view to have those moments that fill the soul and the heart. Just beautiful! So glad to be a part of this Thanksgiving blog hop with you and so many talented bloggers too. Have a great day Anita. LOVE, LOVE, LOVE Black Mountain, NC. Beautiful area and a wonderful artsy community. The best! What beautiful scenery around your mountain home. I sensed the relaxing weekend you spent there in your descriptions and pictures. 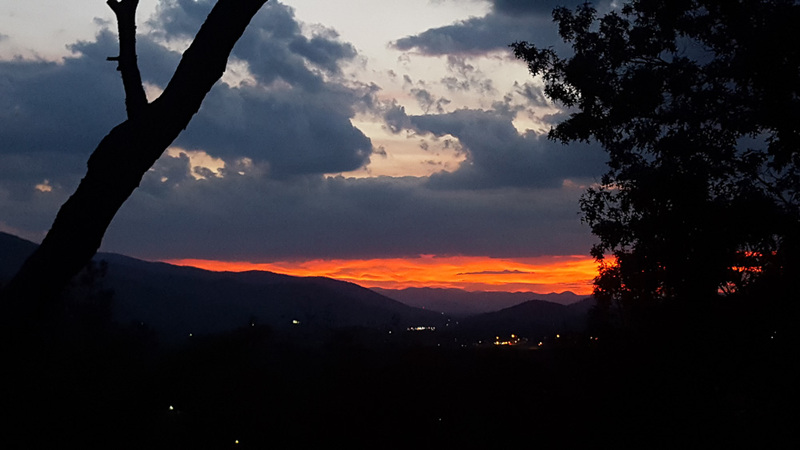 Oh It is absolutely gorgeous…..I love the Blue Ridge Mts!!!! hope to go back there some day….We live in SC and I know what you mean about the leaves in TX, just not the same here either…I am from CT, and miss the fall!!! Anita, this is absolutely beautiful! There’s nothing like the mountains to calm your soul. Is it strange having people stay in your house and use your stuff? I see your gorgeous things there and think I might feel a little weird about that. It’s maybe a little weird, but the income really helps defray the costs, so that’s the way it is for now. This isn’t where I live, so I don’t have my ‘nice’ stuff here, and that helps. What a beautiful and peaceful place! I would love to come here someday. I can smell the Fall in the air. I was so relaxed just reading this Anita, and your photos are beautiful! It’s so nice to get away to an environment that is totally different- and to be welcomed in your own place with fresh bread, wow! The mountain views are breathtaking, do you ever go in the winter? Reminds me so much of my many visits to Black Mountain years ago. So many good memories of being with Kev’s parents and other family members. Those were fun Nancy and I remember those days too. Jenna, it’s so relaxing being there too. I have never been to black mountain but I can say this, looking at your amazing photos makes me really want to go there one day! How can anyone think there is no God! He truly loved us to create such beautify for us to behold! Thank you for sharing those amazing photos! Yes. I hope you make there one of these days Nancy. It had been awhile since I had driven the parkway, so I had forgotten how amazing the views were. Now this is why I am moving back to NC from SC! I love the mountains. You have some really beautiful views from your mountain home. Penny I don’t blame you. Nothing any more beautiful and peaceful than the mountains in the fall! Always centers me and helps me gear up for the cold, dreary winter. 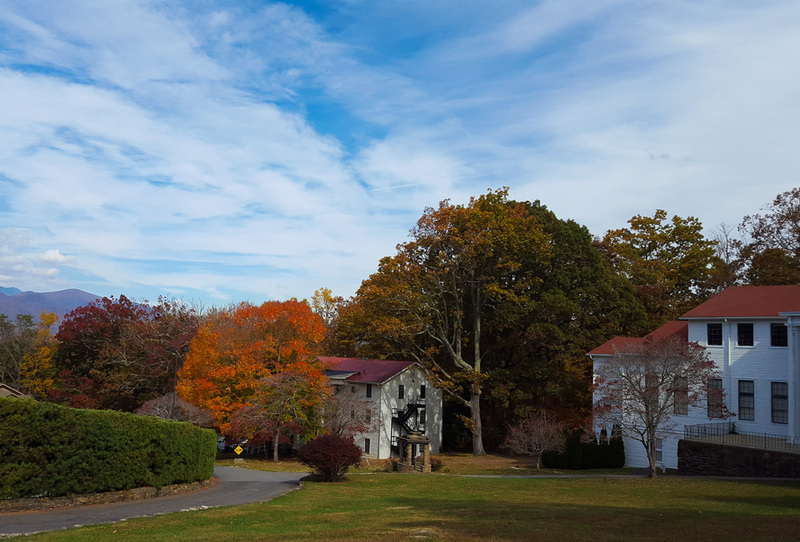 What a wonderful glimpse of fall colors Anita! I too would love to celebrate Thanksgiving in such a beautiful environment. 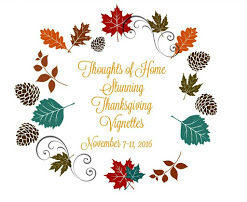 Thank you so very much for joining the Thoughts of Home Stunning Thanksgiving Vignettes tour. My pleasure Laura. It truly is gorgeous. Truly heartwarming. Thank you, Anita. Nirth Carolina is my home state. I live in Colorado now but miss it SO much. Here in Boulder we have mountains that have no color because the mountains are rocks and evergreen trees. I must say that North Carolina has it all. In one day you can be at the beach walking in the sea and sand and you can go to bed that same night in the cool beautiful mountains. And nothing can match those Carolina blue skies. Am I home sick? Think so? WE love it too Alice! Anita, how fortunate you are to have this beautiful home in NC mountains. As you know, I’m partial to NC and have spent a lot of time in those hills during my lifetime. Such a gorgeous place and your place looks spectacular. I know you love it!! Rhoda, I am with you. We’ve spent part of our summers there for over 30 years. I had a hard time coming home last week. 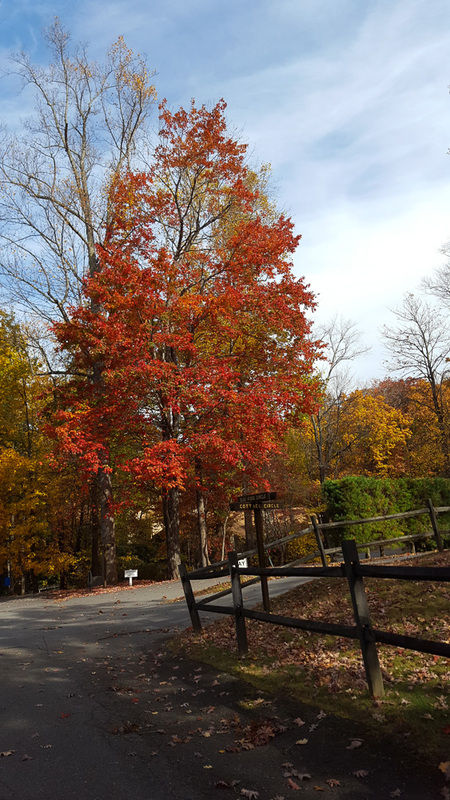 I live in North Carolina and I never get tired of our change of seasons – Fall being my favorite! Oh my! The views are amazing!! So lovely – it touches my heart! We live at Lake Junaluska which is around 40 min drive from Black Mountain. I grew up in Tennessee so I agree it is a wonderful area to live in. The lazy days of summer are bearable and the nights always cool down quite nicely. I think you picked the perfect place for a Mountain Home! There’s nothing as beautiful as Autumn in the mountains!! Enjoyed the tour! Lady bugs hatch every year in my master bath. They are so cute! 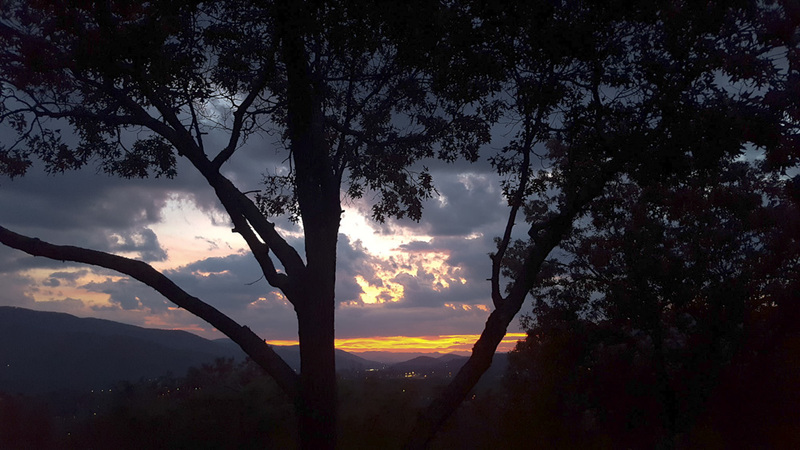 Thanks for sharing your pix of Black Mountain. Incredible examples of God’s handiwork! 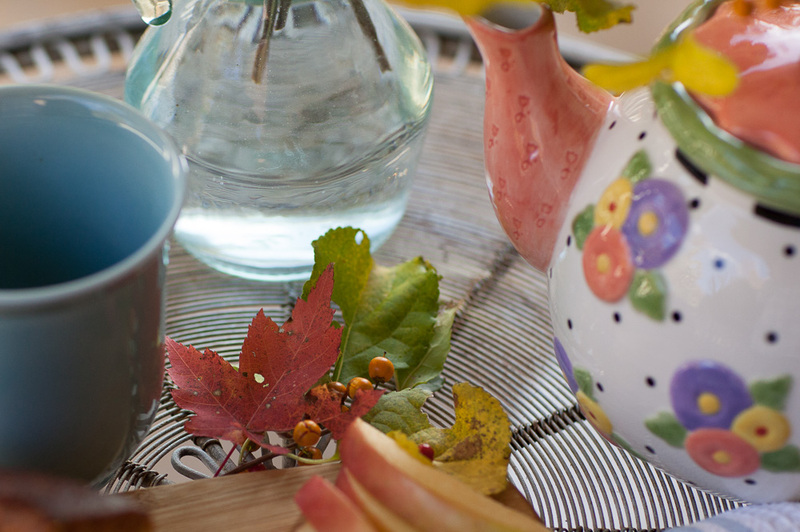 Would you share the name of the teapot pattern show with your article “Thanksgiving in the Mountains.” Thank you! Mary that is an old Mary Englebreit pattern. Thank you for the quick response. Hope you have a wonderful Thanksgiving. such a stunning veiw, god knew what he was doing, amazing! Oh, Anita, I’m so happy that you and your family get to enjoy this lovely home and surrounding countryside! Blessings on your day! *hugs* from Oregon. What beautiful mountains, just gorgeous! Thanks for sharing the pictures. We have traveled the parkway from beginning to end and it is a wonderful ride with fabulous views. 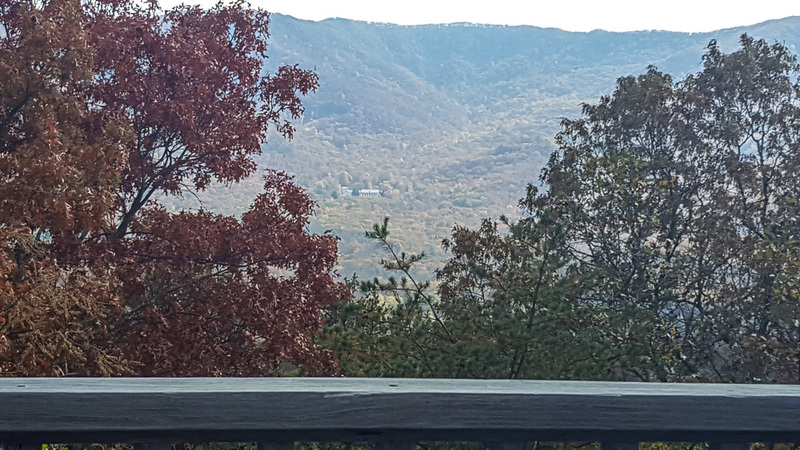 It is in ally getting cooler here in East Tennessee and it’s beginning to feel like Fall…we have beautiful mountains here as well…I can see NC from my porch. So beautiful. I like the idea of putting branches of pretty leaves in the dough bowl for a simple setting, non-fussy. What a beautiful, relaxing place to spend a weekend. I am a mountain-loving woman. The view from your deck brings tears to my eyes. Wishing it were my view. I really like your website and newsletter. Love the nature pictures of your surrounding area. Just warm and cozy to me. Thank you. 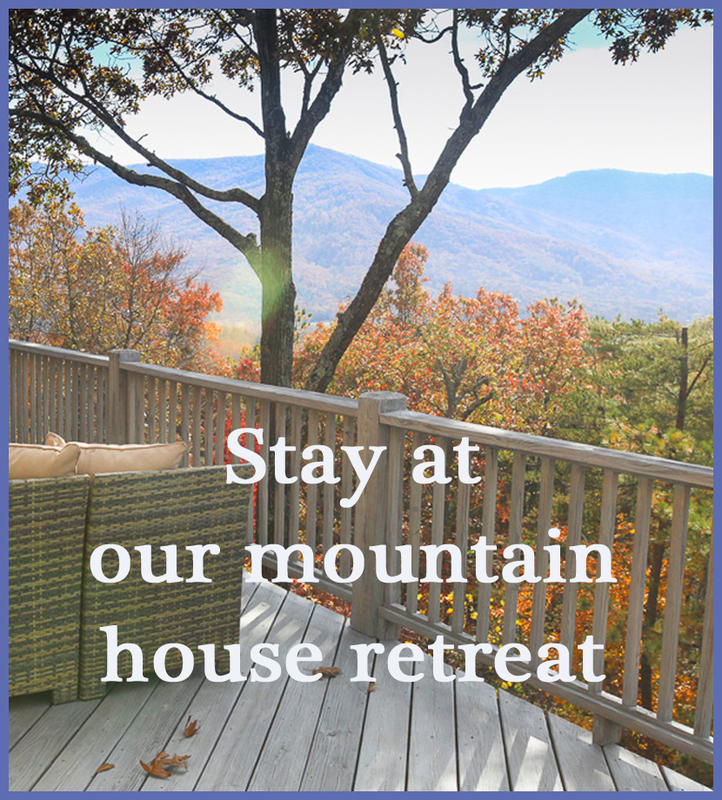 Anita, I loved seeing pictures from your Black Mountain retreat. From the wee ladybug to the al fresco table to the dough bowl, I was swept away to the Carolina mountains. The view is a showstopper, ever-changing and magical, as are your beautiful touches. Enjoyed the tour! 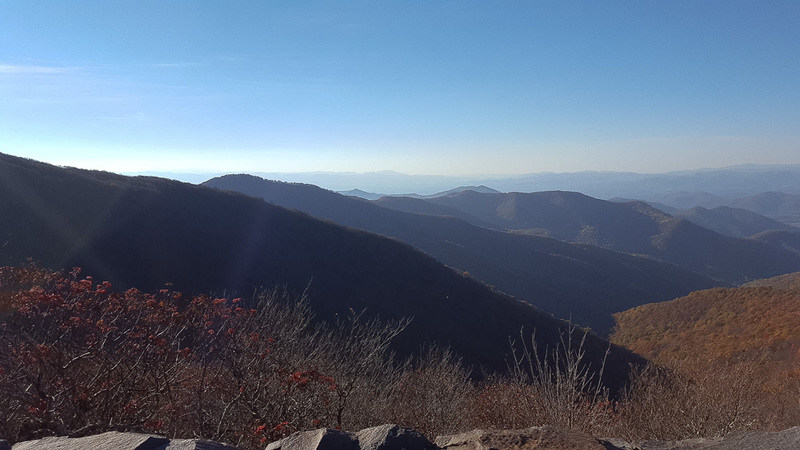 During the fall a few years ago, I did a long weekend get-away with two of my sisters to the Great Smokey and Blue Ridge Mountains. What a beautiful place to be. I can totally understand why you love that location. Simply glorious in every possible way. Loved the pics and I did Pin it for later — in my Bucket List folder! Wow lucky ducks as my grandson would say. My daughter and husband just bought 20 acres in MT and we are hoping to spend some holidays out there once the house or cabin is built. They have a sign in the house that reads “The mountains are calling and I must go” Can’t think of a better way to decribe it. So very beautiful – here in California we also don’t get the fall colors. I would love to visit your retreat one day! Beautiful! Rivaled only by our beautiful trees in the Pacific Northwest where it has been an amazingly colorful fall! Oh. That. View! God’s country. Beautiful!!!! Oh. That. View! Truly is God’s country. Beautiful. Lovely views. I, too, would hate to leave there during the fall….but come spring with the bluebonnets, I’d be back in Round Top! Thank you so much for this beautiful post. The trees are amazing. I really miss the color in So CA, as we do not get the stunning foliage that you do in the mountains. Have a wonderful happy Thanksgiving. You mountain retreat is beautiful. Gorgeous, gorgeous views!!!! Of course the house is just as gorgeous. Excellent taste. What wonderful images of the Fall. Loved every picture of fall in the mountains. Wish I were there to relax and rejuvenate for the upcoming hustle and bustle of end of year holidays. We all need that, don’t we? 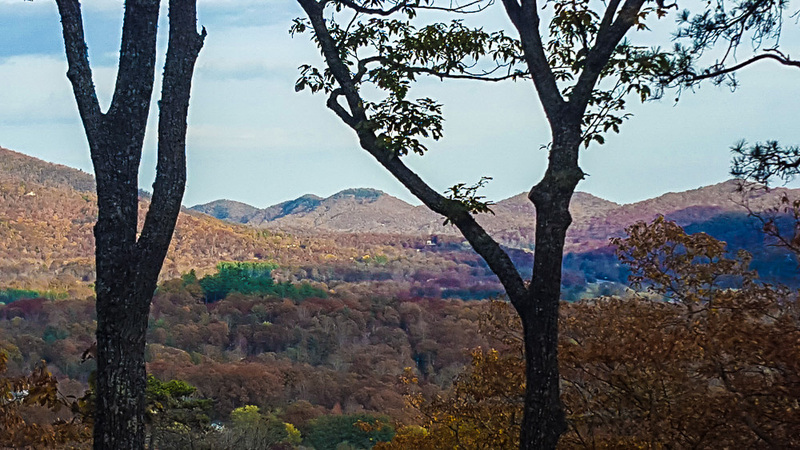 Yes, you are blessed to be able to retreat to a most beautiful place such as Black Mountain…what a most phenomenal view from the porch and every vantage point!….I believe the leaves are just as spectacular in NC as the Northeast….truly an amazing place to unwind and reflect. A trip here would make me just plain lazy . I would sit on that porch all day and half of the night looking at that beautiful view. How blessed you are to have this get a way home. Looks so beautiful there! I live in NC just a few hours from Black Mountain. I’ll have to stay at your place next time we head to the mountains. Thanks for sharing! Hope y’all have a blessed Thanksgiving! 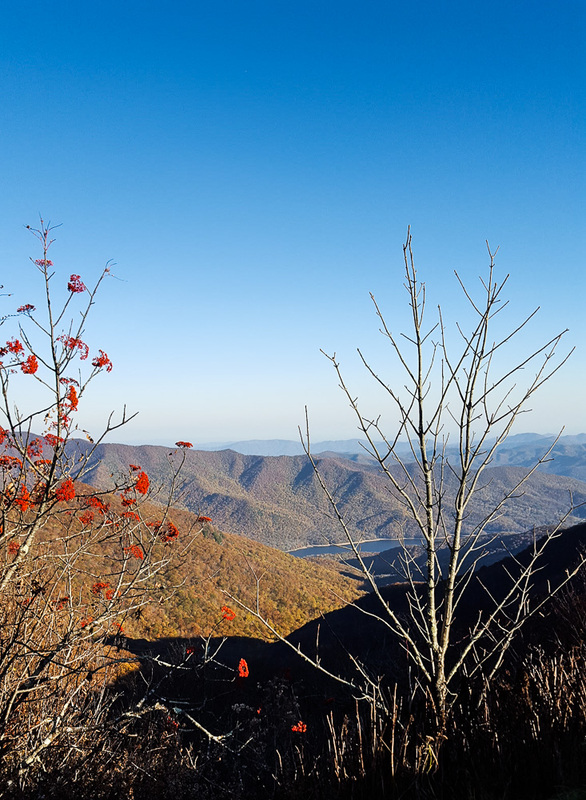 Visiting NC is certainly on my travel bucket list, this post just reinforced that thought! Beautiful location and “cabin”! We just got back from that area… up to the Blue Ridge from Florida and then traveled over to Wears Valley Tn. which is where we had a cabin this year !! Absolutely gorgeous this year…. as is the views from your cabin !!!! Just beautiful !!! Early morning sunrises from the deck… late evening sunsets from the deck !!! Amazing !!! Love every single minute in these beloved hills !!!!!!!! We live on 10 acres of walnuts…this reminds me to take the time to sit on the porch and enjoy the beauty of this time of year! It’s so beautiful there – I hope you’ll be able to spend a Thanksgiving with your family there in the near future. 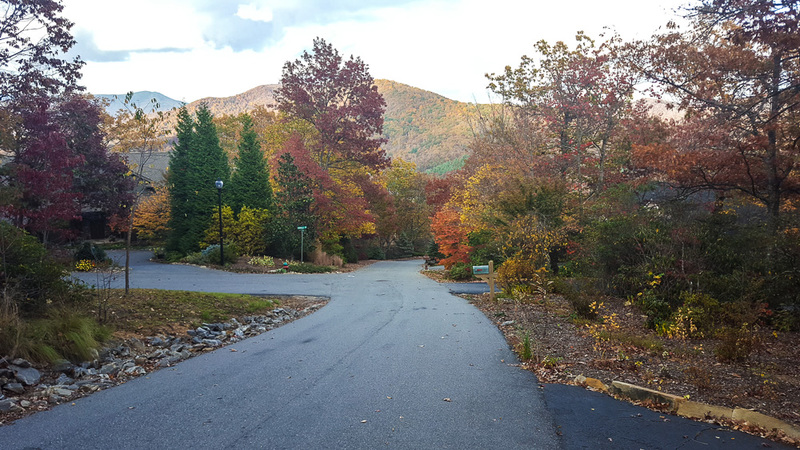 What a beautiful place for a retreat, I go every year to Murphy,NC its just a great place to heal and regroup. I am sure this will do wonders for your mind. Love the Blue Ridge Mountains. That is our yearly vacation spot. This year we got a 5th wheel and camped at an RV park in Waynesville about the 3rd week of October. The mountains were beautiful – the colors were gorgeous. Your place looks wonderful and inviting. Enjoy your Thanksgiving with your family. So happy you had time to rest and enjoy your home ! Looks like a beautiful getaway spot! I’ve been to Black Mountain! Our daughter was thinking of going Montreat and we did a fantastic fall college visit about ten years ago. I’m going to check out your place for a future visit! Truly a lovely place and it would be difficult to leave. Those views are stunning! I could sit on the porch all day. The showstopper is the lovely view at night, when the town’s lights start to twinkle. A pleasure to share in this lovely blog hop. Thanksgiving should be all about family and friends. 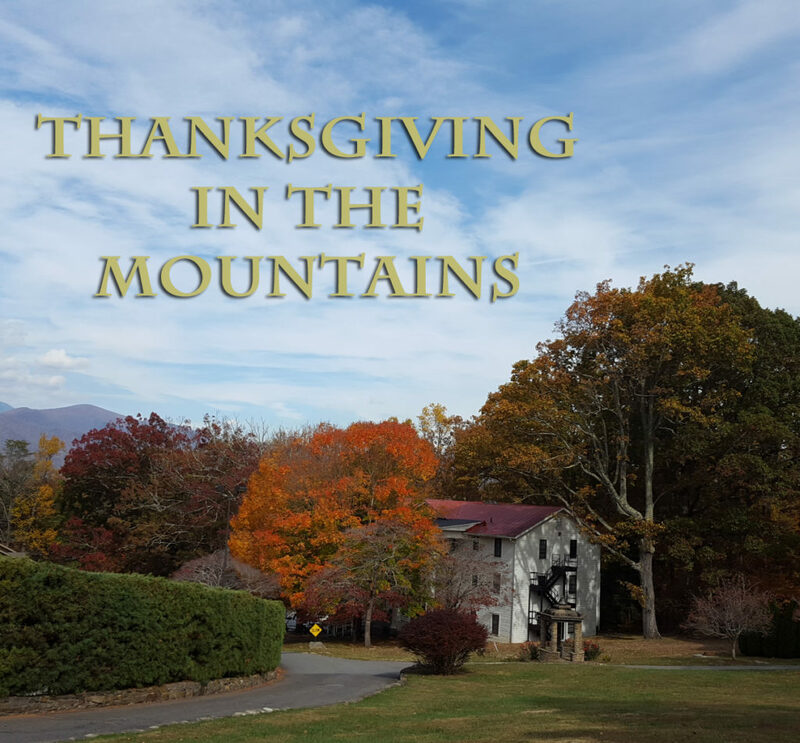 This would have been a fabulous year to spend Thanksgiving in the mountains. I wish you many years to spend Thanksgiving this way! The mountains and the views are incredible. I looked at the pictures on the rental site and I think if I stayed there I would never want to leave! Seriously, I would walk through the house looking at everything while the coffee was making, then pour myself a cup and go sit outside and enjoy the view! Then, repeat! ? The Fall colors were absolutely stunning. I know what you mean about leaves here in Texas going from green to brown. 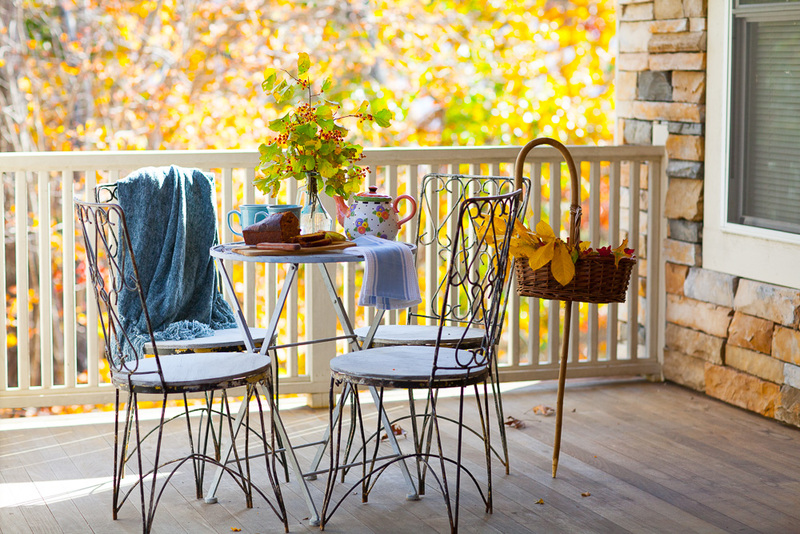 Can’t imagine a more perfect spot than your deck to enjoy the evening. I love that it over looks the town below and you can see the twinkling lights. We have our home on the market and will be moving to the mountains of Northern AZ. It is in the White Mountains. We will have lots of pine trees and can enjoy four seasons. Can hardly wait to be there enjoying the turning of leaves from green to red. I will miss my Son and two grandsons that we will be leaving here in Texas, but that’s what vacations are for. Norma, I wish I could spend all fall in the mountains. I so much enjoyed seeing today’s post. Black Mountain is absolutely gorgeous and I would love to visit. I am a fellow Houstonian (born here and we now live in Katy) and so the true fall colors are just beautiful to me. Fran, I hope you get to visit some day. It’s so pretty and peaceful. I think you would love it. Just an FYI. Those ladybugs are not the typical one, it’s an invasive Asian species that’s become more common in NC. They get into your house to spend the winter and are very hard to get rid of. They can bite and leave a bad smelling yellow stain if you mash them. Thank you for sharing these lovely pictures with all of us. North Carolina is a beautiful place. I was fortunate enough to spend two Summers there.